Chicago takes culinary experimentation seriously. In recent years, a number of restaurants throughout the city have developed novel cuisines and presentations that have made the city a magnet for foodies and chefs alike. With the groundbreaking of a new project on the city’s West Side, the food community is one step closer to having a space where young chefs can hone their skills and launch their businesses. The Hatchery is a 57,000-square-foot incubator that the city hopes will keep the creative juices flowing in the burgeoning local restaurant industry. 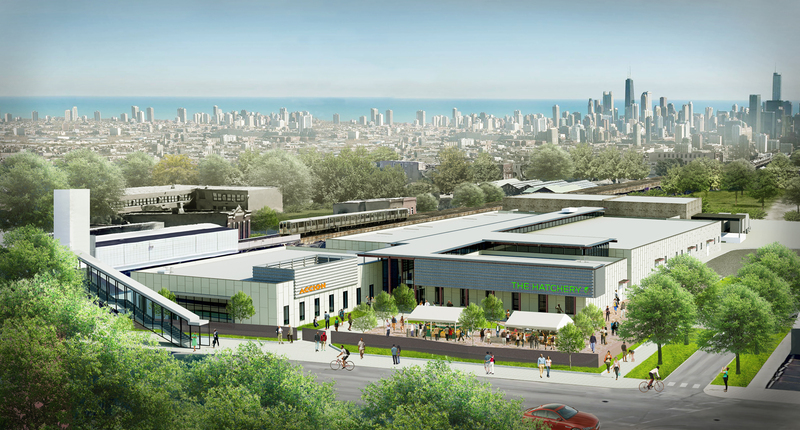 Located in the East Garfield Park neighborhood, directly west of the Loop, The Hatchery will include 56 private rentable kitchens, one large shared kitchen, co-working space, multi-function spaces, bulk storage space, and an industrial loading dock. The complex will be situated in a building from the 1920s as well as a new larger structure. Acting as designer, architect of record, structural engineer, and construction manager is Chicago-based Wight & Company, with site design group handling landscape design. "Adaptability in design is critical for The Hatchery to accommodate flexible programming and future growth," said Matt Zolecki, project executive for Wight & Company, on the occasion of the groundbreaking. "We are creating a space not just for food production, but for mentoring, coaching, presentation, and collaboration." Mayor Rahm Emanuel was on hand for the event, and the city has shown its support for the project in part through the selling of the needed 3.5 acres of land to the development for $1. While it is not overly common for the city to sell land and buildings for such a small amount, it is also not unheard of. In many West and South Side neighborhoods, the city owns enormous amounts of land, which it is willing to let go to organizations that have a clear mission to improve the area. Developing the Hatchery are two non-profit community organizations, Accion Chicago and the Industrial Council of Nearwest Chicago (ICNC). Accion Chicago will also base a new headquarters in the development, where it will work to provide direct access to small business loans and support programs for The Hatchery’s tenants and members of the local community. Kellogg and ConAgra, multinational food companies with Michigan and Chicago headquarters, respectively, are also sponsoring the project. 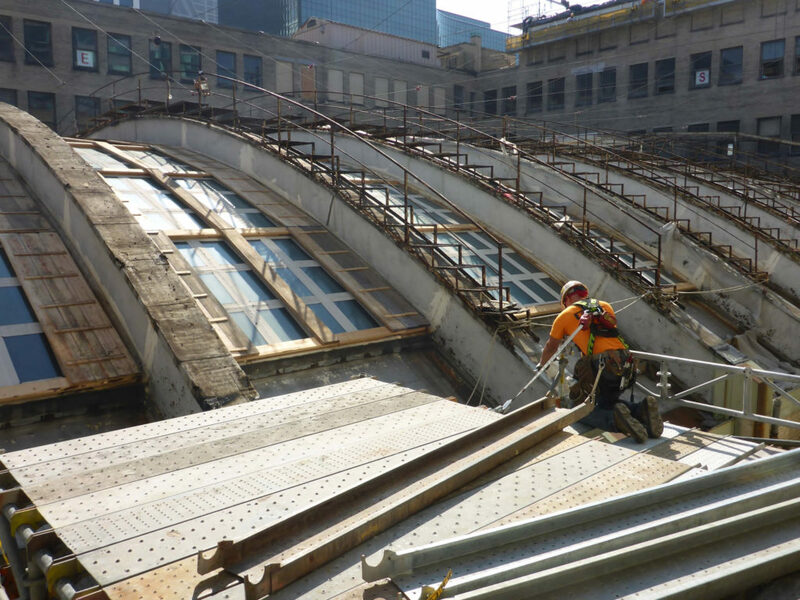 The complex is expected to be completed in 2018 at a cost of $34 million. Thanks to a scalable and flexible design, the initial layout of the project can then be adapted as tenants grow and cook up new ways of working in the space. 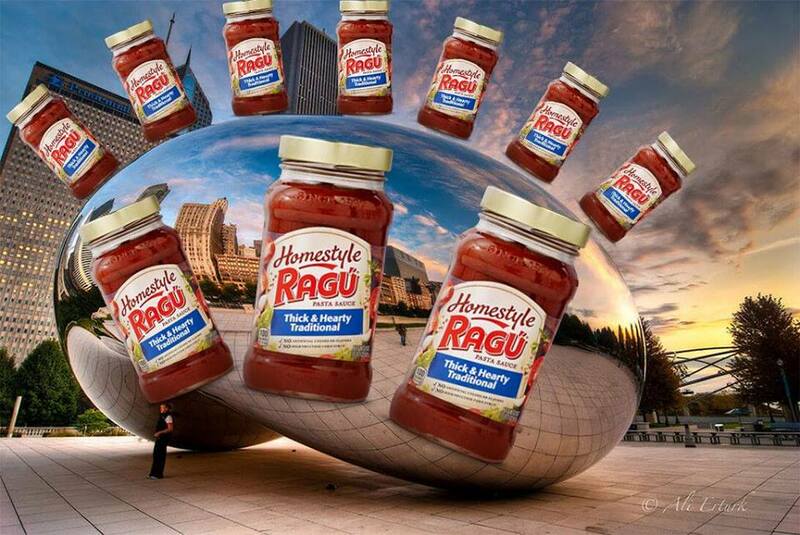 In what is turning into a long-running war of Facebook memes, a handful of Chicagoans are producing Facebook events targeted at the Anish Kapoor–designed Cloud Gate sculpture, also known as The Bean. The events, which have attracted thousands of online RSVPs, range from the silly to the slightly obscene. One string of events seems to have started with Windex the Bean, which is scheduled for November 15. Following its creation, counter events were scheduled entitled Paint the Bean black so they can't Windex it, and Prime The Bean so they can paint it black. Yet another followed that was entitled Pour Paint Thinner On The Bean After They Paint It Black So We Can Windex in hopes of rebutting the others. More ridiculous events, unrelated to cleaning or painting the sculpture, include Flip the bean over so it gets an even tan line and Turn the Bean 90° So it Feels New Again. Another invites guests to Release The Bean into Lake Michigan and shout "You're free!" Speaking of being free, one event plans to Break open the bean to free the tiny man who lives inside. Playing off the "bean" nickname, two other events include Pour Spaghetti Sauce All Over The Bean, and of course Bake The Bean. While there is no sign that any of these events will happen in any way, if you are looking to Succumb to our collective existential dread outside the bean, there is an event for that, too. Robert A.M. Stern took a moment to speak with AN Midwest Editor Matthew Messner about One Bennett Park, Stern’s first tower in Chicago. In part thanks to a long, trusting relationship with the developer Related Midwest, Stern’s office, Robert A.M. Stern Architects, was tasked with designing both exterior and interiors for the project. Design partner Daniel Lobitz is leading a team to design a tower that Stern hopes will capture some of the glamour of old Chicago. The Architect’s Newspaper: What do you see as some of the advantages of being able to control so much of the design? Robert A.M. Stern: I think an architect who has a strong sense of design can create almost anything, and certainly should be able to, and should be encouraged to, carry the design ideas into the interior. Certainly the public areas—lobby, elevators, cabs, and public halls—on any floor in a residential building. We have done that in many buildings and for many of our buildings for Related in New York, including the Chatham, the Brompton, the Harrison, Tribeca Park, Tribeca Green, and most recently, 261 Hudson Street. Can you imagine a Mies van der Rohe building, whether his apartments on the Lake Shore or his office buildings, not being designed by Mies on the inside? I can’t. If you don’t trust an architect to design the inside of the building, why trust them to design the outside of the building? Are there references or motifs that informed the design of One Bennett Park? I think precedent is a very important factor in the design of this building, but it’s a very important factor in the design of any building we undertake. I would say precedent is not necessarily historic. Precedent also can, and should, incorporate local traditions, local vernaculars of local buildings. This tower is our first tower built in Chicago, and only the second time we have built anything in Chicago. (Except for the bus shelters, and I guess there are 2,200 of them, so that must count for something.) I’ve been visiting Chicago as an archi-tourist for virtually all my life, so I know the great buildings are especially relevant to our work. Some of those buildings include the Marshall Field and Company Building in the Loop, and the Palmolive Building on North Michigan Avenue. A fantastic body of buildings—not only in Chicago, but all across the Midwest and other places as well—that inspired us as we began to think about how to shape the tower. Too many tall buildings are just extensions from the bottom up to the top. They may be structurally encased, like the John Hancock, but it’s fundamentally an extrusion. I prefer—among the modernist buildings in Chicago in relationship to this discussion—what in my mind will always be the Sears Tower; I don’t know what it is called this week. It steps up in the most amazing way according to a structural idea of Fazlur Rahman Khan. What are some of the interior features of One Bennett Park that you feel make it exceptional? There is a glamour about some of Chicago’s interiors, residential and not. For example, the lobbies of the Marshall Field Building are wonderful. So, we wanted to capture some of that Chicago glamour in our lobbies. We have two separate lobbies, one for the rental portion of the building, and another for the condominiums. Each has its own design statement. The condominium lobby, which has wood paneling, is traditional, as wood paneling is traditional, but it’s really very stylishly modern as well. There is a visual interest that one associates with buildings of the ’20s and ’30s, and that is sometimes not associated with the buildings of the late 20th century on the whole. We were looking at a lot of Frances Adler Elkins’s work (she was David Adler’s sister). Has there been any particular advantages, or challenges, about building a major project in Chicago? Nothing out of the ordinary. I think we are perhaps entering into a new territory of elegance and detail, and all of that costs money. I hope Chicagoans are getting ready to dip into their deep pockets for our building. The truth of the matter is the cost of habitation in Chicago is substantially lower than in New York. To get this much quality, and to really break out of a rather “businesses as usual” mode, is a compliment to our clients, Related Midwest, to stick their necks out. I just hope we don’t get chopped off. 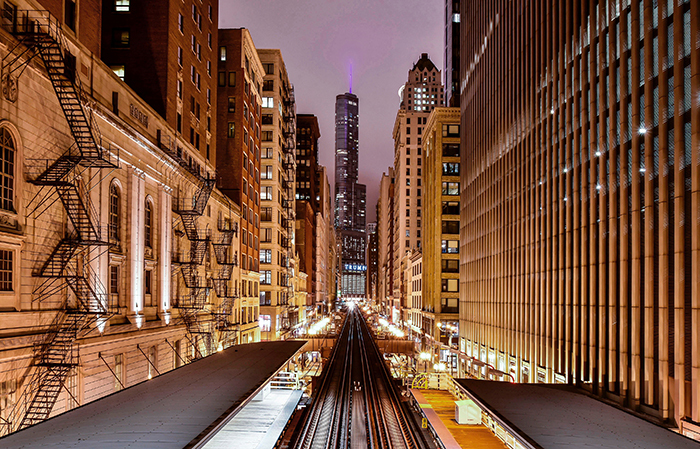 Three generations of Wight & Company have operated in the Chicago area for over 75 years. 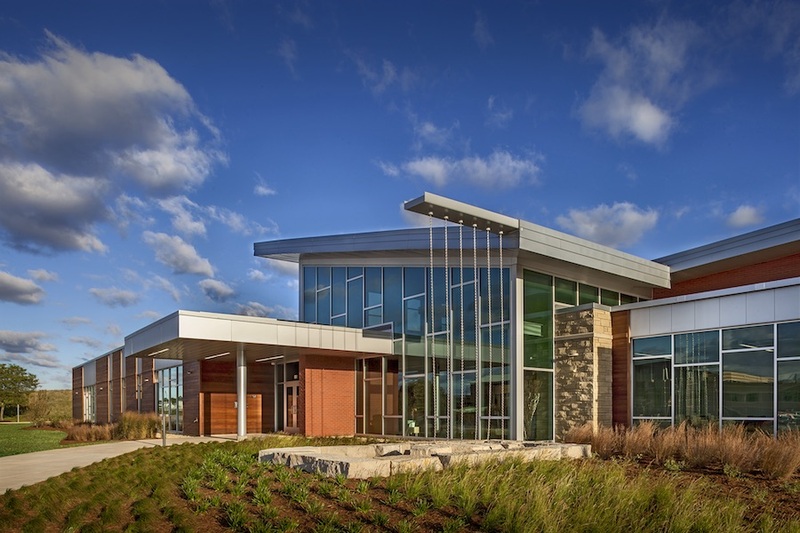 With a main office in the western suburb of Darien and an outpost downtown, the company employs over 175 architects, engineers, and builders. Even with this long history, Wight continues to evolve, and in recent years it has seen major changes. Perhaps the most drastic of these changes happened in late 2015 when renowned Chicago architect Dirk Lohan joined the office and brought his entire firm of Lohan Anderson with him. With the addition of Lohan, the company is now venturing in new directions while bolstering their existing repertoire. As Executive Vice President, Director of Design Kevin Havens put it: Wight is a “design-lead design/build practice.” While the company does not yet build everything it designs, the underlying goal is to recapture some of architecture’s legacy as a field of master-builders. In this, Wight and Lohan found a common value. Having studied and worked under his grandfather Mies van der Rohe, Lohan maintains a sense of urgency when it comes to architects being in control of the building process. While such a large firm has many moving parts, the downtown office where Lohan’s studio is situated is a more intimate setting where a great deal of the design happens. Located in the landmarked Powerhouse Building, snugly flanked by numerous rail lines the building used to power, the office feels like those of many other, much smaller firms. The periodic deep rumbling of passing commuter trains and an occasional leaky roof make the space somehow endearing. Soon to the be the tallest building in downtown Joliet, a large suburb of Chicago, the Will County Justice Center is designed to be more than just a courthouse. With a focus on literal transparency, the center is defined by a large civic square wrapped on two sides by the building’s wings. Programs are arranged in such a way as to give the public maximum access to the justice system while maintaining the high level of security needed in a court of law. The Will County Justice Center represents a long history of Wight & Co.’s experience with civic institutional work. 353 N. Clark Street Chicago 353 N. Clark Street was added to Wight & Co. portfolio with the merging of Lohan Anderson, Lohan’s former office, into the company. The 45-story tower is situated in the River North Neighborhood of Chicago, just north of the loop. The tower represents the direction in which Wight & Co. is hoping to move under Lohan’s leadership: While Wight has extensive experience in institutional and public projects, Lohan has specialized in high-end private projects for much of his career. Mies van der Rohe Business Park Krefeld, Germany With the addition of Lohan to the Wight & Co. leadership, new avenues opened up to the office. As part of an invited competition, Lohan worked on a design for the adaptive reuse of a former power plant, which once served an industrial park designed by his own grandfather, Mies van der Rohe, in the 1930s. Now renamed Mies van der Rohe Business Park, the new building will be used for performances, large gatherings, meetings, and exhibitions. Though not in the same language as the Bauhaus-style white buildings surrounding it, the building is a protected landmark. The design intervention works to be sensitive to the building’s historical context, while updating it for contemporary uses. Hotel Arista Chicago Designed by Lohan Anderson as part of a larger master plan in the Chicago suburb of Naperville, the Hotel Arista will soon be joined by several other buildings designed by Lohan as part of the Wight and Lohan team. The Hotel is the first piece in a larger “urban” center, known as CityGate, in the western suburb. The 144-room hotel was designed to use and waste less, achieving the hotel industry’s Green Seal certification, as well as being the first LEED-certified hotel in Illinois. AN caught up with co-founders of MOS Architects, Michael Meredith and Hilary Sample, and Seattle-based artist and designer John Hogan. The group collaborated with structural engineer Nat Oppenheimer of Silman Engineering to develop a prototype of an interlocking structural glass block. 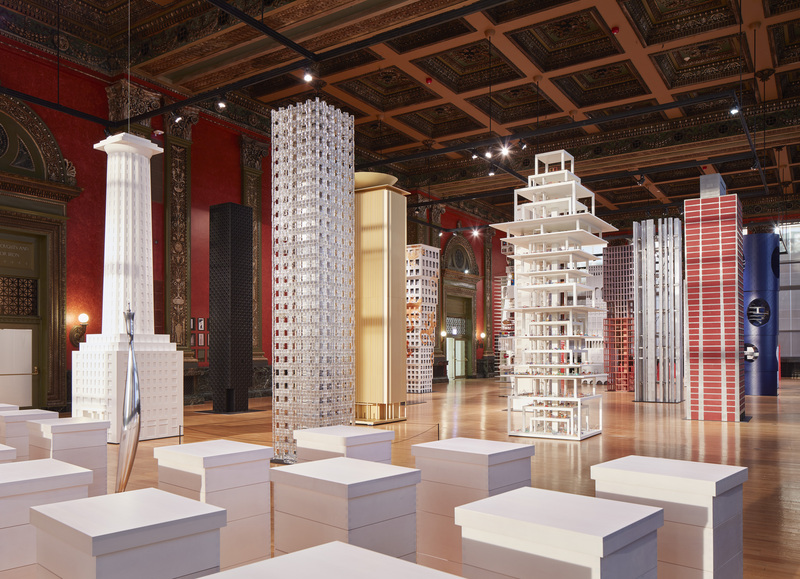 The work is part of Vertical City, a central installation at the 2017 Chicago Architecture Biennial, where sixteen "towers" respond to one of architectural history's most significant competitions: the 1922 Chicago Tribune Tower. Curated by Sharon Johnston and Mark Lee, the towers will remain on exhibit in the Sidney R. Yates Hall of the Chicago Cultural Center through January 7, 2018. Called “& Another (Chicago Tribune Tower),” the project is an orderly stack of three types of modular block units rising to approximately sixteen feet tall. A custom-milled aluminum plate system interfaces with the glass block wall every two courses, providing lateral bracing. The assembly creates a translucent effect, blurring the legibility of the tower’s structural core. "We would like this to be a real building," said Michael Meredith. "This is a full-scale mockup of a 16-foot-tall glass wall. We didn't know what we were going to get at first. It was all a big experiment." The office tapped into technical Ph.D. papers and engineering research utilized in MVRDV's recent glass block project and looked into precedents from offices like Renzo Piano Building Workshop. Michael Meredith said the aesthetic qualities of the glass are what pique most visitors’ interest, but expects the work will spark a deeper conversation about architectural history. The installation pairs the repetitive, rational, and modular thinking of Ludwig Hilberseimer, best known for his ties to the Bauhaus and to Mies van der Rohe, with “one-liner” tectonic jokes—tower as a fluted column, a skyscraper with crenellation, etc.—in the manner of Adolf Loos who submitted a “joke” entry to the original 1922 competition. The tower sits just shy of sixteen feet, remaining "unfinished," with a final course of blocks scattered on the ground below. The glass blocks were handmade, so ensuring the assembly stayed vertically true was a primary concern to the project team. A "peg registration" system—precisely located bumps and divets—was incorporated into the formwork to assist in stacking the modular units. Despite this planning, Hogan said the group was not sure how much tolerance the individual units would have. The solution was to incorporate CNC-milled aluminum plates to provide a rigid template for the glass walls. "Engineering a system that basically gives you a reset every two courses was the best way for us to be confident the tower would stand straight." The glass block manufacturing process lasted only six days and resulting in 750 blocks from three distinct forms. The team used soda-lime glass, one of the most prevalent types of glass available, accounting for about 90% of manufactured glass today. For Hogan, the project is a continuation of techniques picked up at Alfred University in Western New York, a top-notch casting facility with what he calls “an incredible collection of scrap graphite” (an ideal material for hot-casting glass). Hot-casting is a process that involves pouring molten glass into a form. Graphite is an ideal form material as it can be removed almost immediately after the pour, whereas other materials require the glass to cool completely prior to removal—a lengthier process that is inherently more labor intensive. 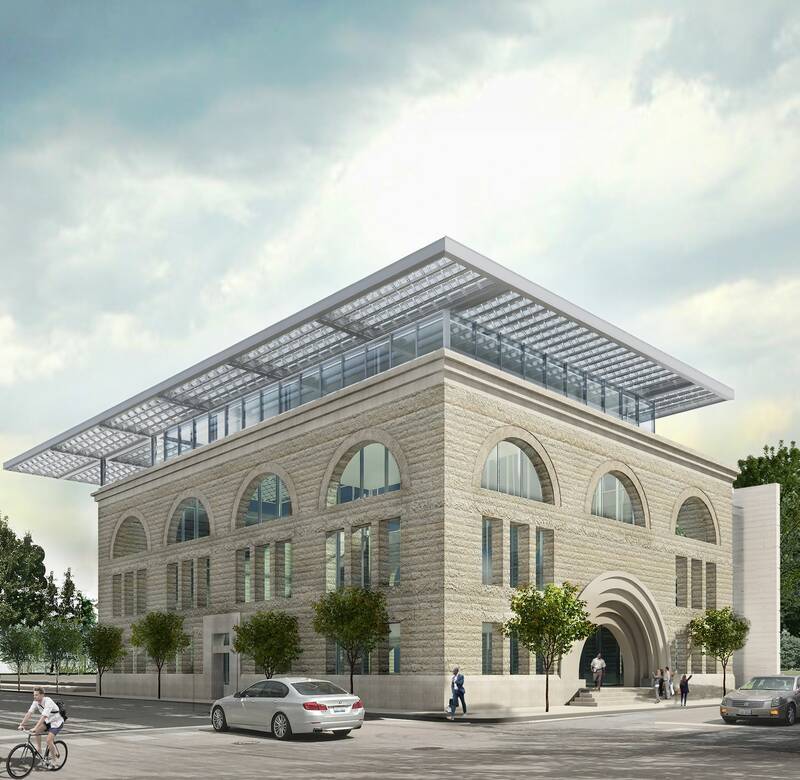 Gensler released the plans for its renovation and restoration of the famed Graham, Anderson, Probst & White Post Office in Chicago. The 1932 structure, out of commission since 1997, will be used for office space, retail space, a conference center, tenant amenities, a food hall, a roof deck, parking, and a river-facing lawn. Renovations will cost over $600 million to overhaul the building that, at 2.5 million square feet, can hold an impressive 2,000 people per floor. It is currently the largest redevelopment in the United States. 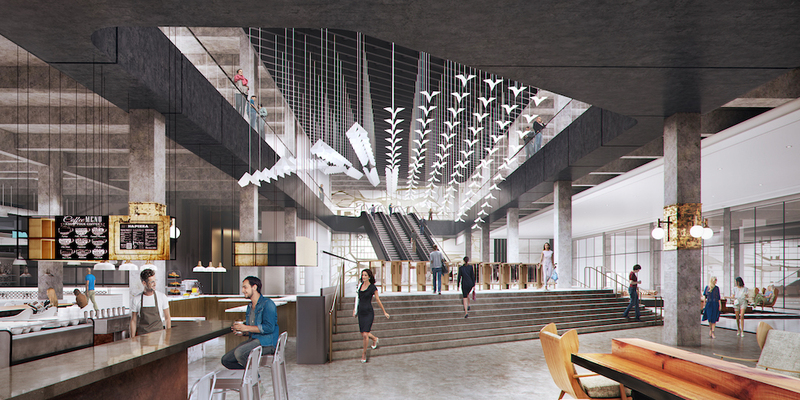 Officially dubbed “The Post Office,” the project features a spiffy new logo that evokes wings in flight, a motif that appears throughout the initial renderings as light fixtures and design elements. While certain original features are restored, such as the postmaster’s office, lobby, mail chutes and scales (the building was placed on the National Register of Historic Places in 2001), interiors are pointedly geared toward millennials (lest you think this is too presumptuous, the fitness center is depicted with the slogan, “Sweat is just fat crying.”). Throughout the space, exposed ceilings are juxtaposed with warm wood, cozy leather, and midcentury modern furnishings, with large expanses of glass revealing views of Chicago and that iconic limestone facade. The exterior is largely untouched, albeit with a four-acre roof deck on top that will hold an impressive amount of amenities, including park space, cafes, a quarter-mile running trail, and sports courts. “We fully recognize the historical significance of this building,” Brian Whiting, president of the Telos Group, which will oversee parts of the project, said in a statement. “When the Post Office was built, Chicago was the center of catalog retail sales and the building was designed to handle fulfillment for the largest operators, including Sears, Roebuck & Company and Montgomery Ward. Fittingly, The Post Office will once again serve to promote the commerce industry, including the e-commerce companies that have replaced catalog houses, but this time with cutting-edge office space.” According to the project's representation, The Post Office's anticipated new tenants have already spurred the development of nearby residential projects in anticipation of the new-old hub roaring back to life. The Chicago Architecture Foundation (CAF) is getting a new home. Currently located in the Daniel Burnham-designed Railway Exchange building on South Michigan Avenue, the institution's offices and exhibition space will soon be located in the Ludwig Mies van der Rohe-designed 111 East Wacker building. With the move will come expanded exhibition space, lecture space, and new offices for the foundation’s 70 employees. 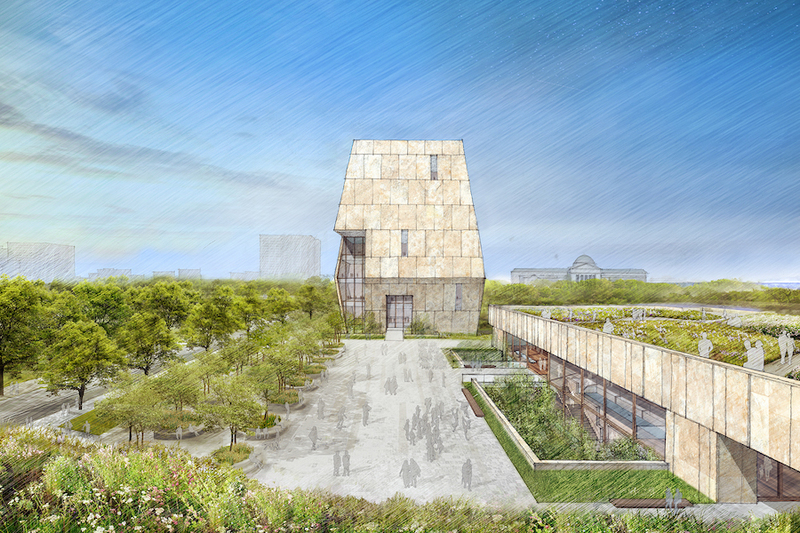 Leading the interior design of what will be called the Chicago Architecture Center (CAC) is Chicago-based Adrian Smith + Gordon Gill Architecture (AS+GG). The 20,000-square-foot center will include 9,000 square feet of exhibition space, to be designed by New York-based Local Projects. “Architecturally the building is a gem,” said Gordon Gill, founding partner of AS+GG in a press release. “The design will create a dynamic and elegant space for CAF that promotes patrons to fully engage in the influence Chicago has on global architecture. The large volume of space fronting the Chicago River also creates an inviting and interactive atmosphere for visitors.” The Chicago City Model Experience, currently located in the atrium of the Railway Exchange building, will be enhanced with interactive digital multimedia. Other permanent exhibitions include the Skyscraper Gallery and the City of Neighborhoods Gallery. Space will also be set aside for rotating galleries, and a new lecture hall will provide space for the CAF’s many public lectures. A new design studio space will be the heart of the foundation’s youth summer camps, and a Tour Orientation Center will be the starting point for its daily walking tours. 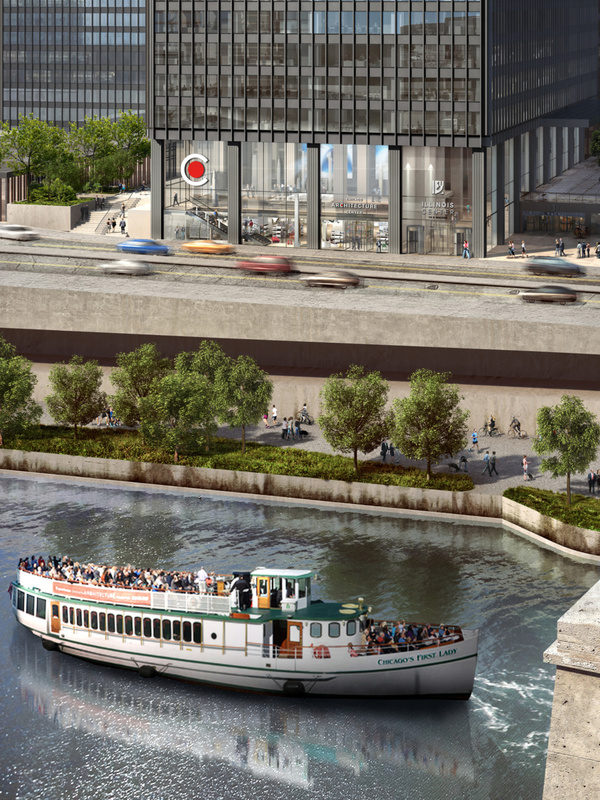 The location of the new center also brings it closer to the docks of Chicago’s First Lady Cruises, the CAF’s river cruise boat. Hundreds of thousands of people either visit or take one of the CAF’s architecture tours every year. 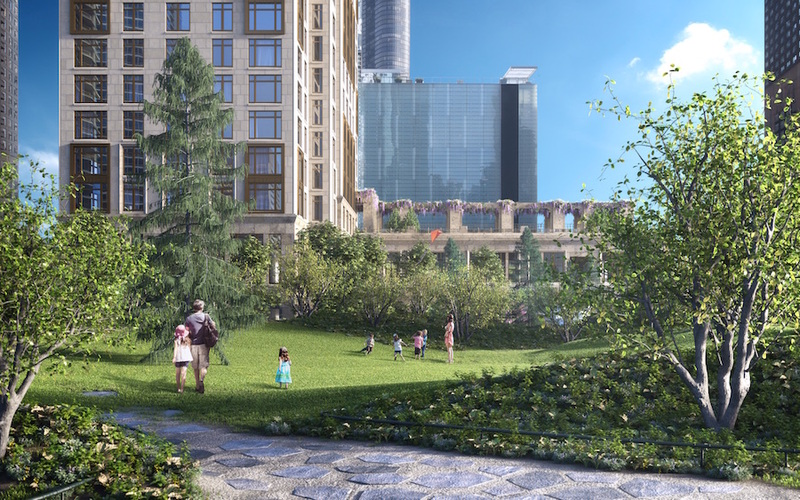 The new location along the river will bring the foundation much closer to the throngs of tourists walking along the “Magnificent Mile.” Chicago River’s shoreline has recently undergone major improvements, with the center being one more major attraction when completed in the summer of 2018. Chicago Mayor Rahm Emanuel has announced a new pilot program to encourage affordable housing in the city’s rapidly gentrifying neighborhoods. The program would focus on areas on the Near North and Near West sides, and along Milwaukee Avenue corridor. Since the dismantling of much of the city’s public housing throughout the 1990’s and 2000’s, Chicago has heavily relied upon private development to fulfill affordable housing needs. To guide this the city passed the Affordable Requirements Ordinance (ARO), which sets rules for new developments over 10 units or that receive zoning changes. The current iteration of the ordinance requires that 10 percent of units in qualifying developments must be affordable, or the developer can pay in-lieu fees up to $225,000. The new pilot program would target particular neighborhoods which have shown signs of rapid gentrification. These include 9 miles along Milwaukee Avenue, incorporating parts of Logan Square, Avendale, West Town, and areas along the Green Line. The goal is to create 1,000 new affordable units over the next three years. To do this, the program proposes to raise the required affordable unit obligation from 10 percent to 15 or 20 percent depending on location. The in-lieu fee option would also be eliminated, forcing developers to build affordable units instead of paying to get out of the obligation. Lastly, the pool of eligible tenants would be expanded by increasing the threshold to 80 percent Area Median Income (AMI), 20 percent above the current threshold. “Access to affordable housing is critical to Chicago’s legacy as one of the world’s most livable big cities, especially as the real estate market undergoes unprecedented neighborhood development,” Mayor Emanuel said. “This initiative will create more affordable units in targeted areas while helping the city to assess the most effective ways of meeting neighborhood affordable housing goals.” If passed by the city council, the program will affect some of the fastest developing areas in the city. Both the Near North and Near West Sides have seen rapid growth, particularly around transit nodes. Thanks to a 2015 Transit-Oriented Development Ordinance, developers have been able to build large residential blocks with few or no parking spaces near major transit lines. The result has been a building boom, which many argue has exacerbated the gentrification in neighborhoods across the city. What’s up with the Chicago Architecture Biennial? The 2017 Chicago Architecture Biennial (CAB) will open its second iteration this September under the theme “Make New History.” This raises some serious questions. Why are we still talking about “history” in architecture? Didn’t the cheeky use of architectural history doom postmodernism? Early postmodernism’s original, successful use of decorative, historic forms was a radically subversive act in the 1960s, a revolt against the hegemony of Miesian corporate modernism. But isn’t there a new language for today’s context? One could make the argument that history is always present in architecture, even if there isn’t an obvious rampant arch or column. For example, as digital techniques took off in the 1980s and '90's, Chuck Hoberman looked to Buckminster Fuller’s geodesic dome for precedent. Isn’t history ironically present even in the most radical ideas? Is referencing "history" a way of going back to the pomo of 1979, or even the Romanesque Revival of the mid-1800s? What do we even mean by “history”? Is there a more underwhelming word in architecture? Do we need another Chicago Tribune Tower competition, which the biennial intends to revisit? Hasn’t the Chicago architecture community—led by Stanley Tigerman (and his late submissions)—done enough of those? It can be argued that the site, context, politics, codes, and people involved in any project leave a mark and, if we look close enough, define and historicize most buildings. How many times can we simplify architectural forms into lower-res versions of themselves until we are at minimalist modernism again? It seems history—rather than a productive starting point for intellectual inquiry—is becoming a flaccid category deployed to showcase the work of friends without thinking too much about the content? Perhaps this would have been an opportunity to consider how architectural history relates to the city and its inhabitants. In other words, what does it mean to be the Chicago Architecture Biennial? Consider the responsibilities of staging a massive architecture exhibition in one of the grandest public interiors in the world. Will summer vacationers Gary and Sheila from Waukesha, Wisconsin, understand—let alone care about—the exhibition? The city's first architecture biennial introduced a formidable group of Chicago practitioners to the larger architectural community and presented a balanced global perspective to the people of Chicago. Was the 2015 biennial so good because it blended the global and local perfectly? Was it the first biennial’s inimitable leadership—Graham Foundation Director Sarah Herda’s on-the-ground supervision and architect-curator Joseph Grima’s global perspective—that impressed Chicago on the contemporary architecture consciousness? What is the real goal of this year’s biennial? Is it to summon the usual suspects for another round of talks and events that will struggle to be different than what we saw Venice and Oslo? Will this year have a balance of geographic perspectives? Will there be too many Swiss participants, and if so, why? Will there be any “history” from the rich history of the global south? Will Chicago Round Two be the point where we finally reach peak “-ennial?” Perhaps what all of this boils down to is: How will “history” operate in this biennial? This could be an opportune moment in which history could connect the biennial to issues outside of architecture, or speculate on new ways architecture could be relevant in the world. It could help point to the future and imagine how technology, the environment, migration, and other nascent geopolitical forces will rearrange the world. Or will we fall asleep listening to yet another reflection on Rosalind Krauss and John Baldessari? So, what is the reason for this return to something that we never really lost? And how will this about-face to “history” be different than past discursive turns? There are certainly new ways of making and working available in examining history, but is “history” just a disciplinary co-opt of a broader, more relevant phenomenon endemic in our cut-and-paste culture and the information age? History in this year's Chicago biennial seems to be used as an empty signifier that denotes taste and style, like the art we might see at EXPO Chicago, which—not coincidentally—will run in parallel to CAB. The curators say they are interested in "the axis between architecture and art." But if we really want to talk about art and architecture, why not look at contemporary art and how it combines disciplinary knowledge with relevant issues—and how it seems to be having better luck than architecture operating in a market that it is completely dependent on?